NETWORK FINALS: SEAL TEAM dropped 0.1 in final numbers. CABLE HIGHLIGHTS: VH1’s BLACK INK CREW topped Wednesday cable despite a 0.15 drop to 0.53, with BEAUTY BAR down 0.06 to 0.24. 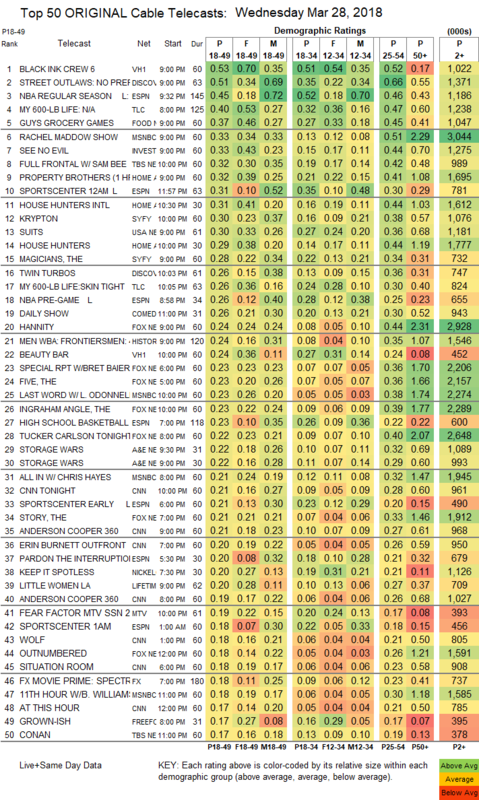 On Discovery, STREET OUTLAWS gained 0.02 to 0.51, and TWIN TURBOS was down 0.05 to 0.26. ESPN’s NBA game was at 0.45. On TLC, MY 600-LB LIFE ticked up to 0.40, and SKIN TIGHT was also up 0.01 to 0.26. Food Network’s GUY’S GROCERY GAMES rose 0.09 to 0.37. MSNBC’s RACHEL MADDOW SHOW led cable news in the demo at 0.33/0.51/3M, above Fox News’s HANNITY at 0.24/0.44/2.9M and CNN’s CNN TONIGHT at 0.21/0.28/1M. On ID, SEE NO EVIL jumped a tenth to 0.33. TBS’s FULL FRONTAL, which aired for an hour, ticked down to 0.32 from last week’s half-hour. On HGTV, PROPERTY BROTHERS fell 0.08 to 0.32, HOUSE HUNTERS INTL lost 0.04 to 0.31 , and HOUSE HUNTERS was down 0.06 to 0.29. On Syfy, KRYPTON slumped by 0.12 to 0.30, and THE MAGICIANS ticked down to 0.28. The season premiere of USA’s SUITS was at 0.30, down just 0.01 from the early (January) 2017 premiere, and down 0.06 from the July 2017 midseason premiere. Comedy Central continued its strong week for THE DAILY SHOW with another Top 20 airing at 0.26. On History, MEN WHO BUILT AMERICA shed 0.04 to 0.24. A&E’s STORAGE WARS was at 0.22/0.22, compared to last week’s 0.18/0.17. On Lifetime, LITTLE WOMEN lost 0.04 to 0.20, and GLAM MASTERS was steady at 0.11. MTV’s FEAR FACTOR was at 0.19/0.15, compared to last week’s 0.17. On Freeform, the season finale of GROWN-ISH dropped 0.03 to 0.17. 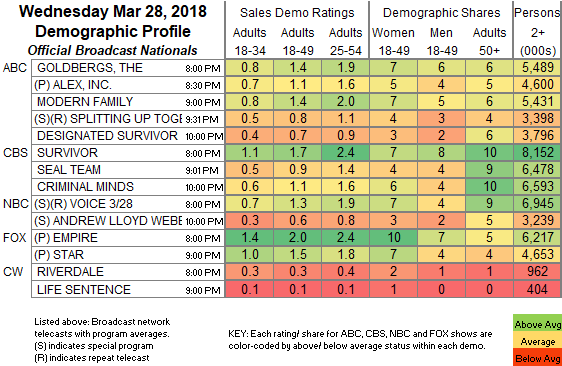 E!’s HOLLYWOOD MEDIUM fell 0.05 to 0.15. FX’s THE AMERICANS began its final season in niche fashion with 0.14, down a tenth from the 2017 premiere. POP’s SCHITT’S CREEK lost a tick to 0.07.